Of all the technical and scientific developments that made possible the European maritime expansion, the nautical chart is perhaps the least studied and understood. This fact is very surprising as it was with the information contained in those charts, and later imported to geographical maps and atlases, that the newly discovered lands were first shown to the European nations. There was, however, a deep incompatibility between these two cartographic paradigms—the nautical charts and the geographical maps—which remained unsolved throughout the sixteenth century and beyond, despite the attempts to harmonize the technical principles of Ptolemy’s Geography with the advances of nautical cartography. An eloquent symptom of such incompatibility was the difference between what was understood as an accurate depiction of the Earth, in the eyes of cosmographers and geographers, and what was considered by the pilots as an accurate nautical chart. 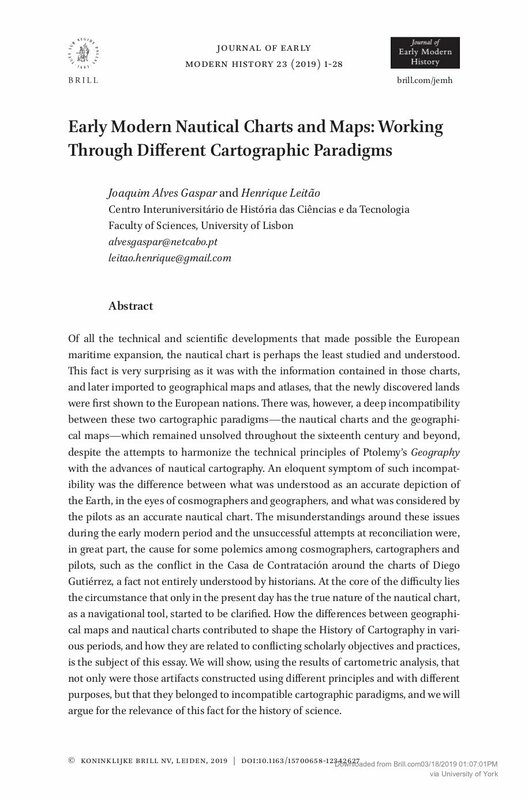 The misunderstandings around these issues during the early modern period and the unsuccessful attempts at reconciliation were, in great part, the cause for some polemics among cosmographers, cartographers and pilots, such as the conflict in the Casa de Contratación around the charts of Diego Gutiérrez, a fact not entirely understood by historians. At the core of the difficulty lies the circumstance that only in the present day has the true nature of the nautical chart, as a navigational tool, started to be clarified. How the differences between geographical maps and nautical charts contributed to shape the History of Cartography in various periods, and how they are related to conflicting scholarly objectives and practices, is the subject of this essay. We will show, using the results of cartometric analysis, that not only were those artifacts constructed using different principles and with different purposes, but that they belonged to incompatible cartographic paradigms, and we will argue for the relevance of this fact for the history of science.